Obon / Sushi + Bar + Ramen will be next door to the Cadence student housing complex (and its ground-level World of Beer, shown here), in the old Gio Taco location. The new restaurant will fuse a mom-and-pop sushi spot with a party vibe. 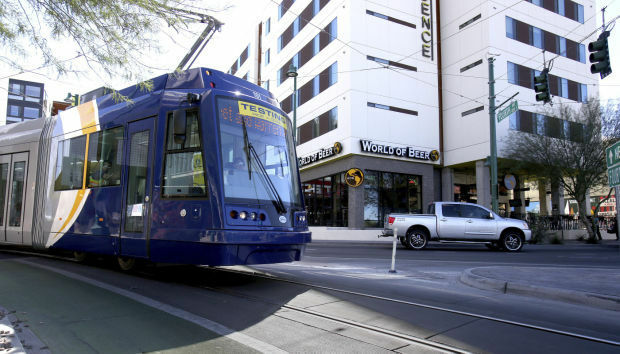 Hours of operation for Tucson’s modern streetcar could be extended to better coincide with bars’ closing time, officials say. The possibility of extending the streetcar’s current operating schedule is based on recent feedback in surveys completed by students, faculty and staff at the University of Arizona and businesses along the streetcar corridor. They say running as late as — or later than — 2 a.m. will make the streetcar more convenient to late-night riders along the bar-heavy route, which connects the UA campus to Fourth Avenue and downtown. City leaders, however, are unsure how to pay for the extended hours. In the university survey, more than half who responded preferred that the streetcar stay open until at least 2 a.m. on Thursdays, Fridays and Saturdays. A separate survey to businesses along the streetcar corridor revealed similar results. Many students and local bar managers say stopping the trains before bars close could pose a public-safety hazard. Extending the hours would make the most sense, he added, as Fridays can often be busier than Saturdays. Many students have no class on Fridays, so Thursday nights can be busy as well. The streetcar operating budget has three main sources of revenue. The city expects to pay $4.5 million to operate the streetcar in its first year. To cover that amount, city officials anticipate the RTA will contribute $1.2 million, fares will cover about $1 million, and Tucson’s general fund will pick up the remaining $2.3 million. Those numbers could rise or fall ﻿depending on how many maintenance problems crop up and whether ridership numbers fluctuate over the year. If that money isn’t enough to cover the streetcar’s existing budget, de Leon said it is unknown what the next step will be. That worries students and bar managers. After leaving, customers crowd around outside, talking before catching a cab or getting a ride home. With so many people trying to board the streetcar, it might not work, he said. However, Quigley said that is a perception that may need to be tempered with reality. After leaving a bar, streetcar riders will be taken to a station, and then will have to figure out how to get home from there.